Toys and balls not included. 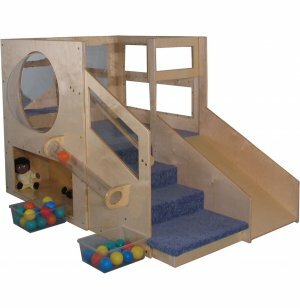 This Adventurer Infant Toddler Loft from Strictly for Kids encourages small children to development gross motor and social skills while having fun. Extra-deep steps, lower hand rail, fully sanded and rounded edges and a slide with safety barrier keep infants and toddlers safe. Loft area and stairs are fully carpeted and include a full mirror and unbreakable Lexan windows that let caregivers keep young ones in full view. 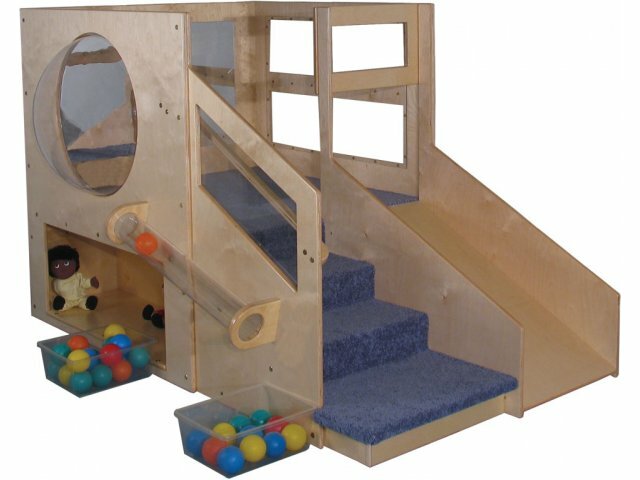 A tracking tube and unbreakable Lexan bubble panel add to the fun, while two storage areas provide the perfect place for ride-on toys, balls, dolls and more. Constructed of Baltic birch plywood for lasting beauty and stability. Convenient Storage: Two storage compartments allow easy storage of toys and equipment. Fun: Bubble panel and tracking tube add extra fun.